A. presume the administrator doesn’t know what he or she is talking about? B. go back to the reading room and attack the waiting worklist of studies? C. find out what the hospital wants or needs from your group and how you can provide it? Radiologist and consultant Lawrence Muroff, MD, told writer David Yeager that he’s had administrators at three different hospitals level that lack-of-a-skill-set-to-help-thrive charge at the radiology groups serving their hospitals. Yeager spoke with Muroff and others for his article about some of the expectations and demands the future—and not the distant future—will place on radiologists (see page 12). Cost pressures and the implementation of the Affordable Care Act are changing health care delivery and reimbursement. The trouble is we don’t exactly know how. Many suspect—and I agree—that physicians’ time-tested traditional response of working harder, faster, and more efficiently to increase volume will prove less successful than it has been over the past 25 years. “It’s tempting to hunker down and do more of what you’ve already done: do it more efficiently, do it faster, hire midlevels to help you,” Cynthia S. Sherry, MD, FACR, told Yeager. Sherry, who is the medical director of the ACR Radiology Leadership Institute and chair of the radiology department at Texas Health Presbyterian Hospital Dallas, thinks that’s a mistake: “But the fact of the matter is, that’s only going to take you so far. 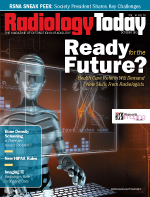 After that, you need to develop new skills in order to be effective in the future.” Yeager’s article discusses Muroff, Sherry, and others’ thoughts on what skills and tactics radiologist will need to stay successful in a changing, less collegiate field. The logic behind Sherry’s comment makes “B” the wrong answer to the question at the beginning of this note. And that’s the important point. The coming change figures to be significant enough that medicine’s traditional volume response will not be nearly as successful as it has been in the past. Also in this issue and related to coming trials, RSNA President Susan S. Donaldson, MD, replied to our request and shared four challenges/opportunities that she sees facing radiology. As a sneak preview of RSNA 2013, we matched each of her chosen challenges/opportunities with programs related to the topic from the upcoming meeting in Chicago.